The gray, gas-in quick disconnect with male flare fitting. Convenient to use, easy to clean. 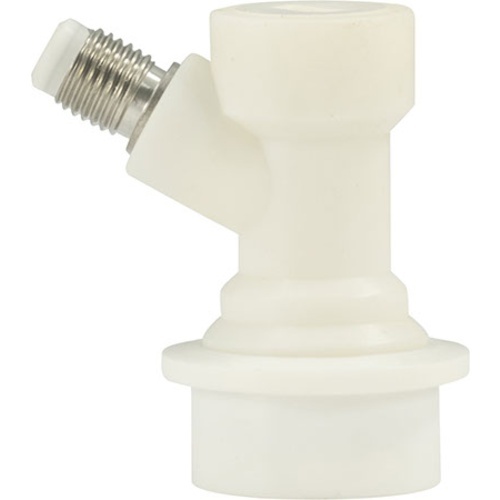 Find out for yourself why so many brewers prefer to work with flared keg fittings. Because the fitting-tubing junction is threaded, it can be easily disconnected for cleaning without having to clip your line. Also makes swapping between ball lock and pin lock kegs in the same draft system a snap! I'm looking to connect https://www.morebeer.com/products/ball-lock-gas-flare.html to https://www.morebeer.com/products/flare-fitting-14-tee.html will this accomplish that? BEST ANSWER: You will need something more like this. Namely, the hose with flare fittings to go in-between the Tee and Ball lock. Came as ordered, no issues.